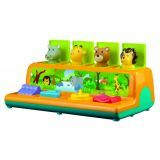 Push, pull or twist the different levers to make the animals pop out! Measures 10” × 5.75” × 5”. Ages 12 months and up. Gently scrub, wash and massage - feel the softness. No more stinky wash cloth. 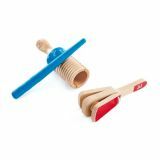 Use in bath and also as a fidget/sensory toy. 100% silicone brush. Soft hair-like bristles to gently wash & massage. Measures 5.5” x 3” x 1”. 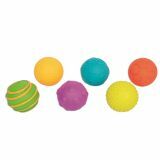 Balls have different colours and textures. Each piece measures 2.4" diameter. Set of 6. 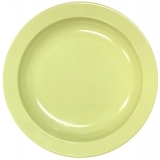 Safe and strong, these dishes will last through daily use and abuse. Set of 4 “pull back” soft autos. 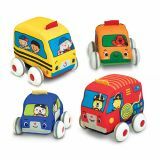 Plastic base can be detached and the soft car is machine-washable after removing wheels. 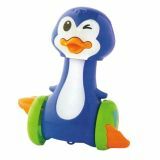 Press penguin's head to see him scoot across the floor with a cute waddling motion. No batteries needed. 6 months+. Gently sloping sides safely protect baby during changes. Measures 30"x18"x6"
Wood beads are strung together with an elastic cord and can be manipulated into an endless number of configurations. Surface wash only. Measures 5.5"L x 2.5"H x 4.5"W. Ages 3 months and up. 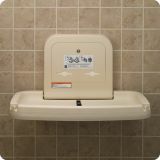 Constructed of polypropylene and has a unibody steel chassis for superior strength. The steel-on-steel hinge has greater resistance to wear and improved durability and the gas spring mechanism ensures smooth open and close of the unit. The dual liner cavity with lock minimizes operator refills and discourages potential vandalism. 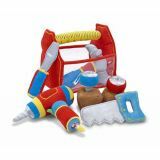 The product includes child protection straps and bag hooks. ASTM and EN compliant. Meets ADA requirements when mounted properly. Bed surface exclusively contains Microban® antimicrobial, reducing odor causing bacteria. Liner dispenser features two liner cavities. Each cavity holds 25 liners, for a combined total of 50 liners per unit. Constructed with 16% recycled materials; contributes to LEED certified building requirements. Additional Shipping Charges Apply. Measures 35 3/16”W x 22¼”H x 4”D (closed) 23 3/16”D (open). Weighs 28 lb. For children up to 50 lb and/or 3.5 years. 3 pieces. Ages 12 months and up. Owls slide down the matching chute and makes a sound. 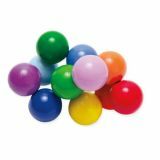 Features 2 bead sliders with colourful beads to fiddle with and the sorter itself can roll across the floor for even more fun! 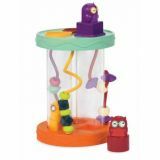 Includes 1 each of a square, circle and triangle shape and 1 shape sorter. Ages 18 months and up.